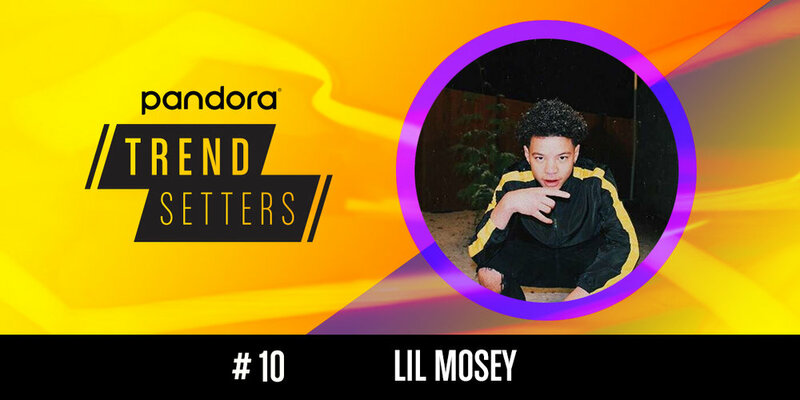 Lil Mosey's come-up has been a quick one. The Seattle rapper saw viral success earlier this year for his single "Pull Up." Now, he's done it again with "Noticed," which has seen over 1.1 million streams on Pandora. Mosey makes a solid debut in the top 10 this week to the tune of over 2,500 weekly artist station adds. If you love trap and you also have serious 90s-era nostalgia, then Joey Trap might just be your new favorite rapper. The Bronx native has been making a name for himself with songs that reference 90s/early 00s pop culture like the Spongebob Squarepants-themed "I Got Top In Bikini Bottom." To date, that track has seen close to 13 million streams on Pandora, and has helped him reach over 2,000 artist station adds per week on the platform. Newer PostUnlocking Pandora Data & Answering Your FAQs! Older PostAnnouncing Our Partnership with Eventbrite!